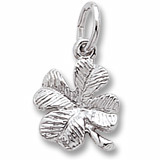 Charm of the Week is the Four Leaf Clover! Most Charms are good luck or good feelings, but the Four Leaf Clover is at the top of the list. Keep your luck and good feelings at a high level with powerful and meaningful charms. Careful of the Lepruchan, he is always after our lucky Charms.